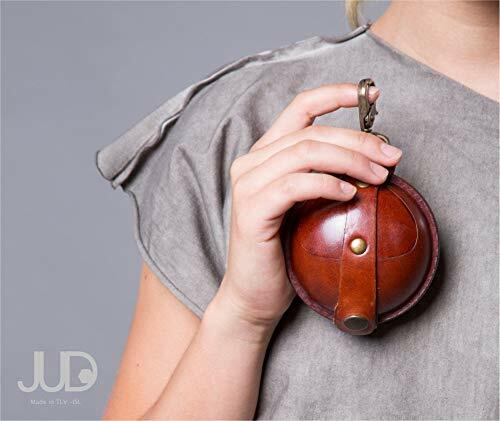 This beautiful handmade ball shaped leather purse / leather wallet can be attached to your keys, on top of your bag, or just hang from your belt loops. This is the most original handmade gift that you can give. Made from the sturdiest leather, this unique coin purse can contain bills, coins, lipstick, keys, earbuds, pills, jewelry, and any other small item that might get lost in a big bag. This wallet features a metal carabiner, a front top opening with a top leather strap, and a metal snap for hermetic closure. It can be ordered in the listed colors, and in 2 sizes: small and large. Additionally, you may order the JUDTLV matching leather strap for a chic and easy crossbody/shoulder bag option. If you have any questions about this product by JUDtlv, contact us by completing and submitting the form below. If you are looking for a specif part number, please include it with your message.